One of the things that I am so very thankful for, is the blessing of my little home. It's astonishing to me just how much my kids and I have been able to accomplish in the two years that I've owned it. 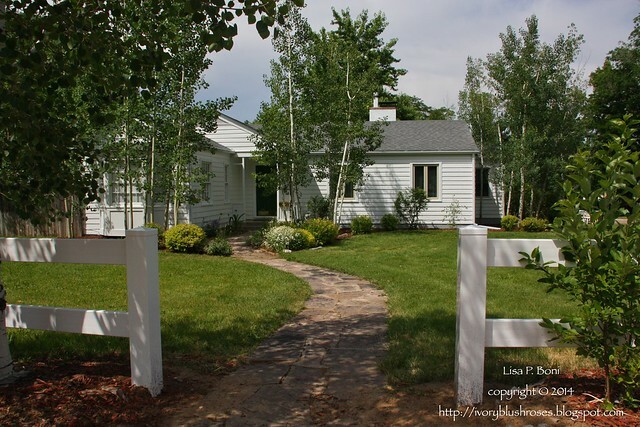 I would like to share the transformation of my little cottage in a series of Before & After photos. This was the view of the house that I saw in the real estate ad about the house. I fell in love with how it sat amongst all the trees. Sadly, when I viewed the house, even the very first time I drove past it, I realized that the big cottonwood trees were going to have to go. The tops of them, which you cannot see in this photo were half dead and it was obvious that some huge branches had broken off. In fact, when you search for the address of my house on Google Maps and look at the street views, the photos must have been taken shortly after one of the big ones had come down as the yard is a mass of enormous broken limbs, branches and leaves! I was terribly sorry to see the trees go, as the way the house nestled among the trees was half the charm, but I sleep much better when it is storming out, knowing that there won't be any huge trees coming down on the roof! 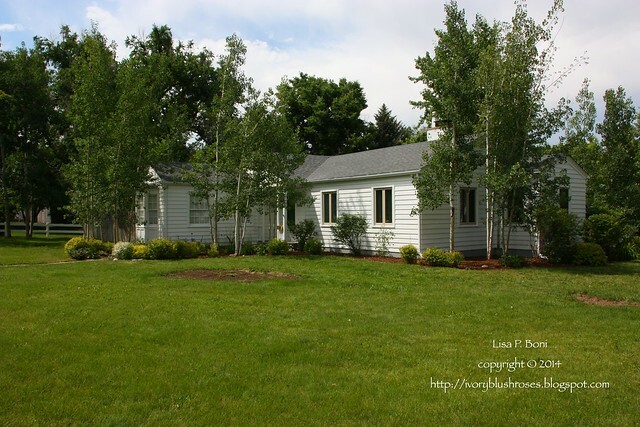 Today, my little house still nestles among the trees, though they are just some aspen trees around the house. You'll also note that I made a decision to remove the shutters and not replace them. It's a decision I'm really happy with. Many of them were half rotted and the amount of debris and bugs that had accumulated behind them was astonishing. This side of the house is my favorite part. I love the protected side entrance and the flagstone terrace between the driveway and the house. When I purchased the house, it was terribly overgrown and the flower beds around the terrace were mostly bare and unkempt. This photo of the side was taken just as we were finishing renovations, days before my daughter's wedding. You can see that things have been cleaned up, the shrubs pruned, and the flagstone path relaid (and completed!). 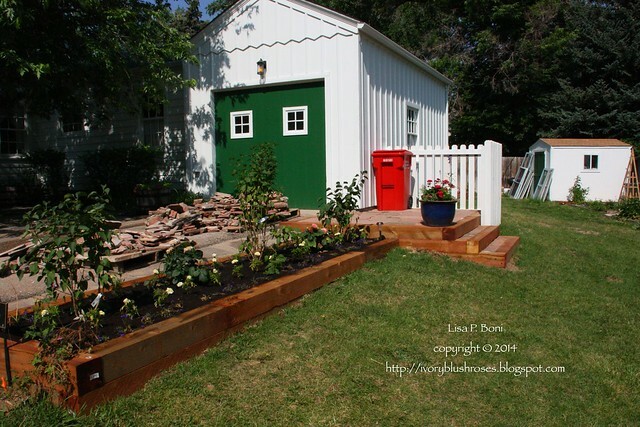 On the right of the driveway, the overgrown half dead elderberry bushes were removed and a raised bed was installed and planted with lilac bushes which will grow to create a new hedge. This is the view of the side terrace when I bought the house. I knew even then that this would be one of my very favorite parts of the house and could imagine sitting on the porch in the evenings with my glass of wine! We trimmed the shrubs, dug out thousands of tightly packed day-lilies that never bloomed, added mulch and some new flagstone edging around the beds. It transformed the space beautifully! The blue paint on the chimney and doors made the porch a gloomy place and it wasn't terribly welcoming somehow. I knew it could be better! What a difference the white paint made! It brightened up the side porch and made it such a welcoming space! And the green doors were the perfect accent! We spent so much time out here once it was painted and cleaned up! The transformation in the back yard was no less. Here, even in that first autumn season we hauled away a huge amount of junk that was heaped in corners and in the garden and shed. The old cottonwood stump was rotting and caused a huge mound in the yard that made it hard to mow and nothing except a few hardy weeds and dank mushrooms would grow around it. The flagstone fireplace was crumbling and a catch all for leaves and spiders. It just wasn't a very nice place to be. But goodness, it had potential that I could see. Even though I did not anticipate being able to do anything with this part of the yard for a long time to come, I started thinking about how I could transform it. My initial plan to knock down the fireplace and extend the patio behind the garage and put a pergola over it resulted in removing and replacing the entire patio, regrading the back yard and reseeding the lawn as well as the addition of two flower beds along the patio and a new arbor. And the pergola that started it all? Well, that looks like a project for sometime in the next year or two! The back yard was full of overgrown shrubs and things growing in seemingly random places. The blue trim on the house gave it a rather haphazard feel and showed off every little oddity of construction somehow. 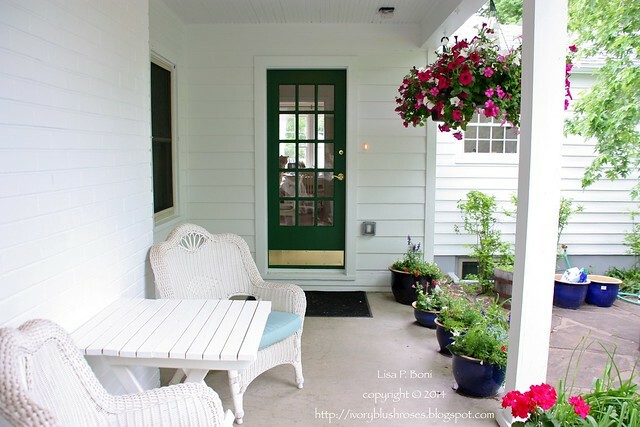 A new coat of white paint and only the doors painted green added wonderful new life to the house. It looks so fresh and crisp now! The garden area was a junk heap full of wooden pallets, dog toys and other broken down stuff when we moved in. There were many chinese elm tree saplings growing in it along with many weeds and a few hardy herbs that were taking over what space they could. A new coat of paint on the shed renewed it and made it match the rest of the house. 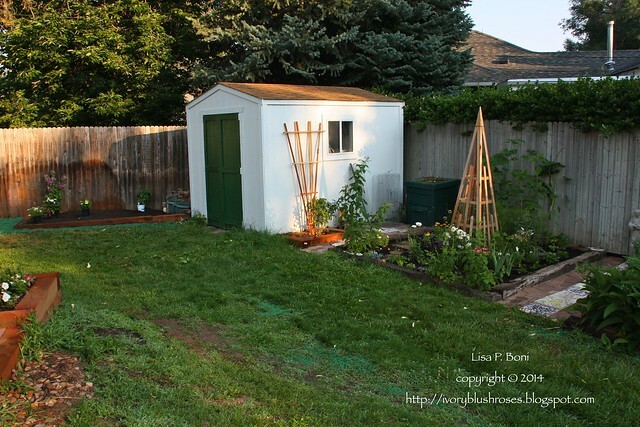 In the garden beds, the saplings were rooted out, the weeds controlled and the herbs either moved, discarded or pruned severely to bring them back into submission. In between the garden beds, Jessie and I added flagstone paths using the mosaic pavers that we found all around the yard. New tuteurs were added as well as a small trellis for the grapevine. Lots of new perennials were planted in order to make the garden look lush and ready for the wedding. Next year, these beds will need redone as the timbers surrounding them are disintegrating and the layout needs a little work and the grapes will need a larger arbor to climb on. Along the side of the garage, the old fence was in terrible shape, with a gate that wouldn't open properly because the post supporting it were rotten. It blew down in the winds of last winter. The slope on this side of the yard was difficult to deal with as well and the water ran off the garage roof and pooled against the foundation. 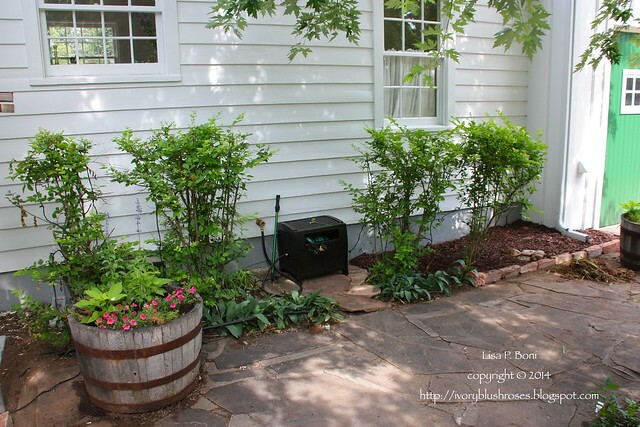 A new step was added with a spot for the garbage cans and a new bit of fence to enclose it. 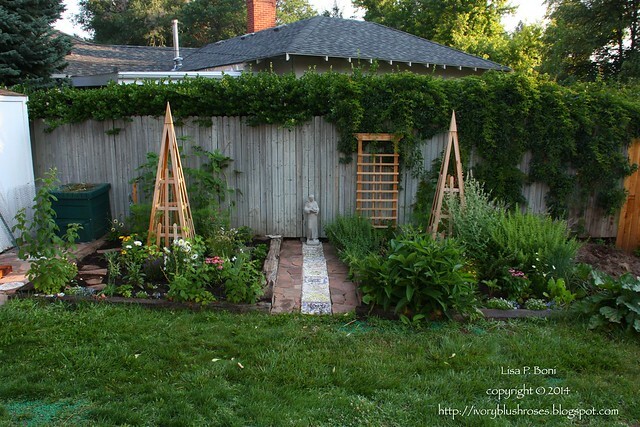 It changed the whole side yard and made it feel so open and lovely! We opted not to replace the fence dividing the front and back yards here. It is still my sweet little cottage, but now it settles into it's surroundings and looks so happy, just like it's owner! There is still plenty to do. I'd love to replace the windows with new thermal pane windows to match the original 6 over 6 double hung windows. Someday, I'd like to replace the inefficient wood fireplace with a new gas fireplace. I hope to get an oak tree planted out in the front corner of the yard and maybe another apple tree or two. The verge along the road still needs to be refurbished. I hope to plant a variety of shrubs with seasonal interest there ~ some bittersweet, beauty berry, Korean lilac, etc. 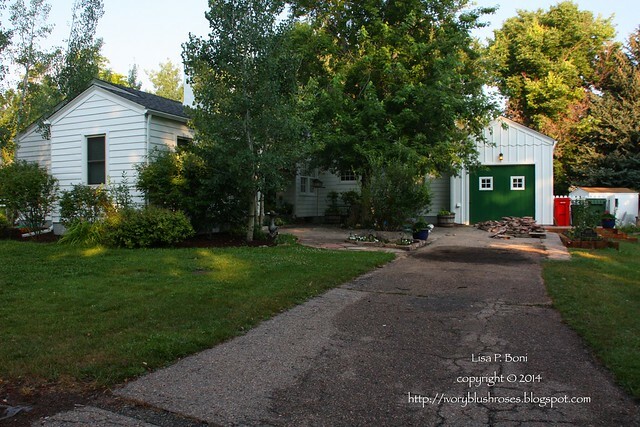 In back, I hope to get a pergola up behind the garage. And the garden beds will get redone. The side terrace flagstone needs repair as the roots from the maple tree are causing it to lift in places. And the driveway needs sealed. 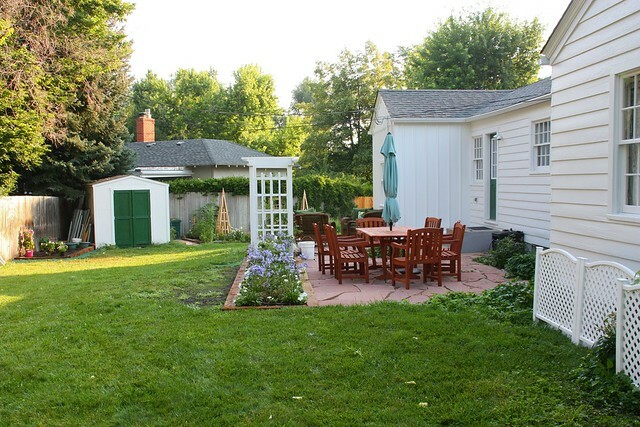 But for now, the yard is moderately easy for me to manage with just a little help and I have room for my beloved roses, some lilacs and a few blooming trees! It's my bit of paradise on earth! Nice to revisit the transformation and to be able to see the before and after pictures. You've done an amazing amount of work and it shows! You've done an incredible job Lisa. Such a transformation! You should be very proud. It is looking great!! Dear Lisa ~ I love what you have accomplished in such a short time.!! It looks happier and brighter, and it is still in the woods. Have a wonderful week in your sweet little cottage. It's truly impressive what you've accomplished in just 2 years! I'm sure you'll have all the other additions done in no time. Thank you for sharing the befores and afters - beautiful place! I love your house and it still looks nestled into the trees:) And the way you photograph things is so wonderful. The leaves in the prior entry really hit me. I feel like I have visited you. Two years! I feel like you just moved in!! What a welcoming, charming next you've created for yourself. And it's so YOU!! I hope to come sit on that porch one day with you and stitch...I'll bring the wine!! Congratulations!